Take a day trip from Guatemala City to the towns of Panajachel and Chichicastenango. In Chichiscastenango, discover the star attraction, the local open-air market, where you can browse handmade goods like wood products and ceramics. You’ll see the historical Iglesia de Santo Tomas (Church of Santo Tomas) and the Calvary Church, also located in Chichiscastenango’s central plaza. Next, you’ll visit the small, lakeside town of Panajachel, where you can follow your guide along Santander Street, the town’s main street, and enjoy fabulous views Lago de Atitlán (Atitlan Lake). Visit the towns of Chichicastenango and Panajachel on this full-day tour from Guatemala City. After pickup from your Guatemala City hotel, your tour begins as you head northwest to Chichicastenango. Feel as if you’ve gone back in time as you walk along the town’s narrow, cobblestone streets and past its red-tiled roofs. 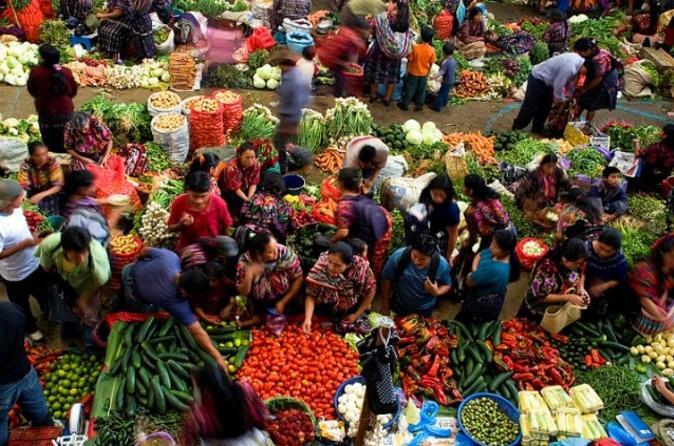 In the central plaza, discover Chichicastenango’s most prominent attraction, the open-air market, filled with local goods like ceramic pots, wood carvings and other handmade wares, as well as fruits and vegetables. Browse the locally made goods and pick up a souvenir or two to take home! While you’re in the plaza, visit the Iglesia de Santo Tomas (Church of Santo Tomas), located on the east side of the plaza. Dating back to 1540, the church is often home to Mayan rituals. On the west side of the plaza, visit Calvary Church, a smaller version of Iglesia Santo Tomas. Next, depart Chichicastenango and continue your day trip to Panajachel, a small town located on the northeast shore of Lago de Atitlán (Lake Atitlan). Known as a hub for traveling across Lago de Atitlán, Panajachel is a quaint, charming town where you'll have lunch at a local restaurant (own expense) before heading over to the town’s main thoroughfare, Santander Street. Stroll down the street with your guide and observe town life going on at the locally made handicraft stalls, other shops and restaurants. Admire beautiful views of Lago de Atitlán from the shores of Panajachel before heading back to Guatemala City.